The heartbreaking video comes with a stern reminder from Perth Zoo: "reduce your use of plastic and dispose of it responsibly." 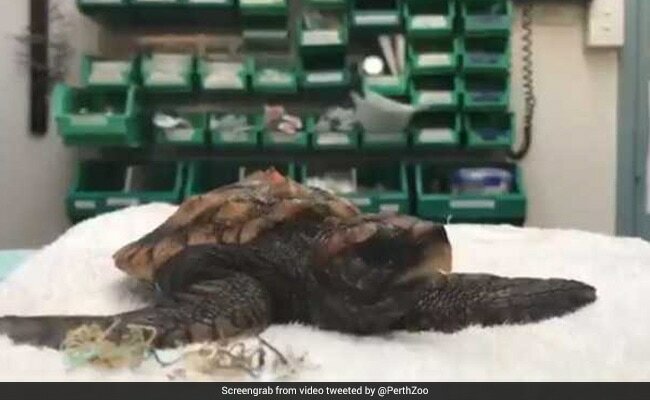 A heartbreaking video released by an Australian zoo shows a pile of plastic next to a baby turtle that had swallowed it in the ocean. The turtle has been pooping out plastic, says the zoo. The video comes with a stern reminder from Perth Zoo: "reduce your use of plastic and dispose of it responsibly." The endangered Loggerhead turtle - believed to be less than a year old - was brought to Perth Zoo's vets by Western Australia's Parks and Wildlife Service after being rescued a few weeks ago. The zoos were shocked to see tangled bits of plastic in the turtle's faeces. "The poor turtle has been pooping out plastic ingested from the ocean!" the zoo writes on Twitter. In the video, the zoo staff placed the plastic next to the animal in an effort to remind people to try and cut down on their use of it and dispose of plastic responsibly. The video has shocked Twitterati, many of whom appreciated Perth Zoo for helping the little animal out. "Poor lil guy! Sending healing love and aloha," tweeted one person. "Thank you, for taking good care of our world," tweeted another. Turtles can sometimes mistake things such as plastic bags for jellyfish. "Plastic swallowed by mistake can cause blockages of the stomach and intestines of marine animals such as turtles," explains Queensland's Department of Environment and Heritage Protection on their official website. Loggerhead turtles have been on the threatened species list since 1978, according to National Geographic.